What: Columbus Underground’s sweetest event is back for the fourth year! Join us on Sunday, February 3rd at The Exchange at Bridge Park for the Sweet Treats Dessert Festival to celebrate all things sweet! 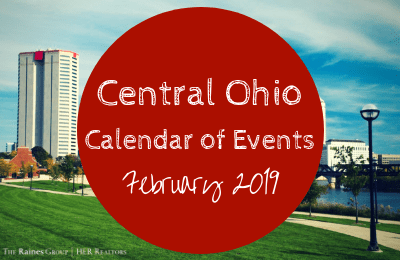 The event will feature bites from some of Columbus’s Best Treat makers, interactive experiences, hands on stations, cocktails and more! Each ticket gets guests access to the full event and a treat sample from each local sweets maker. Tickets are $15 and available for two timed sessions Noon-2pm or 2pm-4pm. A limited number of Early Bird tickets are available for $25 and give guests exclusive access to the event from 11am-Noon and include access to the Noon-2pm session. We are excited to give back a portion of the ticket sales to the Gifts of Kindness Fund again this year! What: Beer here! The 9th Annual Columbus Winter Beerfest is back again February 8th & 9th at the spacious Greater Columbus Convention Center. The event will feature hundreds of varieties of craft beer from more than 130 breweries from down the street and around the country. The event will also feature local food trucks and restaurants. Proceeds benefit Animal Rescue Partners. What: With book, music and lyrics by Lin-Manuel Miranda, direction by Thomas Kail, choreography by Andy Blankenbuehler and musical supervision and orchestrations by Alex Lacamoire, “Hamilton” is based on Ron Chernow’s biography of Founding Father Alexander Hamilton. “Hamilton” is the story of America’s Founding Father Alexander Hamilton, an immigrant from the West Indies who became George Washington’s right-hand man during the Revolutionary War and was the new nation’s first Treasury Secretary. Featuring a score that blends hip-hop, jazz, blues, rap, R&B, and Broadway, “Hamilton” is the story of America then, as told by America now. What: The one and only Cher is set to hit the road with the HERE WE GO AGAIN Tour beginning January 2019. Following the recent global success and rave reviews for Cher’s role in the “Mamma Mia 2 – Here We Go Again” film, the multi-award winning singer, actress and show-stopping performer will be crossing the U.S. for the first time in five years. Cher is expected to perform many of her hits along with some new songs from the “Dancing Queen” album – Cher’s tribute to the music of ABBA. What: The CINCH World’s Toughest Rodeo is making its way BACK to Nationwide Arena on February 16th, 2019! It will be MORE THAN AN 8 SECOND RIDE in 2019 as the CWTR celebrates 40 years of bringing the Ol’ West to cities across the country. We are proud to be coming back to Columbus, OH and cannot wait to serve up some RODEO action like you have never seen before. Don’t forget to come early for the FREE (with Rodeo ticket) Pre Show from 6-7PM. Fans can meet and greet the cowboys and cowgirls – get autographs and take photos! And stay for the post rodeo concert by Special Guest Chris Lane. What: The Arnold Sports Festival, already the largest multi-sport event in the world, will grow even larger in 2019 when an estimated 20,000 athletes from 80 nations compete in a record 80 sports and events from February 28 – March 3, 2019 in Columbus, Ohio. Headlining the nations largest multi-sport festival are professional bodybuilding and strongman competitions with the most well built and strongest athletes in the world. These premier physique and strongman competitions are featured on four stages at the Greater Columbus Convention Center.